Note: this article originally appeared in the March 2001 edition of ESA's publication "On Station". Eckart D. Graf is the X-38/CRV Project Manager at ESTEC. The CRV will return International Space Station (ISS) crews of up to seven astronauts safely to Earth in the event of a medical emergency, Station evacuation or if the Shuttle is not available. The CRV is the operational version of the X-38 prototype, which is being developed cooperatively by NASA, ESA, DLR and 22 European industrial firms in eight countries. Within 3 hours of departure from the Station, the Deorbit & Propulsion System (DPS) thrusters are fired to initiate the descent, and the module is jettisoned. The CRV enters the atmosphere at an altitude of about 120 km, travelling at 27 000 km/h. Attitude is controlled initially with cold-gas thrusters but, as air pressure increases, the rudders and body flaps take over. A drogue parachute deploys at 8 km altitude, stabilising the vehicle in a 1 g sustained sink rate. This is followed by the 5-stage deployment of the large 685 m 2 parafoil. Automatic guidance, navigation and control (GNC) software steers the CRV through its final descent and landing, with a safe forward speed of less than 10 m/s. Building on the expertise developed in the X-38 programme, ESA and the European industrial team are now transitioning into the CRV programme. Europe brings a wealth of experience in reusable manned space systems and atmospheric reentry (see also the ARD article in this issue) to the programme. 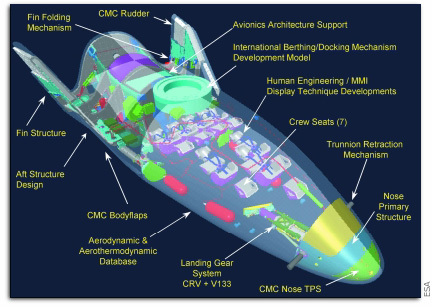 CRV development is in two phases: Phase-1 includes the design activities up to the Critical Design Review; Phase-2 will include the production of four operational CRVs, two CRV/ISS berthing adapters, including the International Berthing/Docking Mechanism (IBDM), four DPSs and the provision of spares and sustaining engineering. With the full start of Phase-1 in 2001, the first operational CRV is expected to be at the Station before mid-2007. Until then, astronauts will rely on Russian Soyuz capsules in emergencies. Major milestones during the early part of Phase-1 are the System Requirements Review after 3 months, an Intermediate Design Review (IDR1) at 6 months, the Preliminary Design Review at 9 months, and the Safety Review and IDR2 at 12 months. ESA began early Phase-1 activities in December 1999: aerodynamics and aerothermodynamics; qualification activities for the Ceramic Matrix Composite (CMC) material, for the hot structure body flaps, rudders and nosecap Thermal Protection System (TPS); display technique development and man-machine interfaces; design activities for the IBDM; and system and subsystem engineering 5 Station as part of the integrated ESA/NASA team at the Johnson Space Center (JSC) in Houston. Since the programme began, Italy has confirmed its participation and Austria has joined as the 9th participant. Overall, countries have increased their contributions � allowing a larger ESA programme � and have vowed a further increase no later than at the end of Phase-1, in order to secure a European role throughout CRV's operational phase, including the provision of spares and sustaining engineering. Following the approval of the consolidated programme by ESA's Manned Space Programme Board in September 2000, the Request for Quotation was issued to industry in early October. The Phase-1 proposal, received in December, is being evaluated, with a view to starting the full Phase-1 in the second quarter of 2001, synchronised with NASA's industrial Phase-1. The scope of ESA's participation will go beyond the X-38 partnership with NASA, and will include additional subsystems or elements, such as the foldable fins, the fin-folding mechanisms, the trunnion retraction/extension mechanisms, the crew seats and the hot structure body flaps and nose TPS (provided for X-38 by DLR's TETRA programme). Europe's industrial team will also evolve from the X-38 team, with MAN Technologie and Alenia Spazio sharing the role of prime contractor, and leading a team of 19 subcontractors in Austria, Belgium, France, Germany, Italy, The Netherlands, Spain, Sweden and Switzerland. ESA's CRV Programme is linked to the ISS Exploitation Programme: ESA is negotiating with NASA the terms of an Implementing Arrangement (Barter Agreement), under which ESA will receive NASA-provided Station services such as transportation and high data-rate services in return for ESA's CRV participation. CRV contributions will be deductible from the Station's variable costs under the exploitation programme. The CRV is based on the X-38 technology demonstration and risk-mitigation pathfinder programme. ESA is developing 15 subsystems or elements of the V201 X-38 spacecraft, scheduled for launch by Space Shuttle Columbia in September 2002. In addition, ESA is providing the GNC software for the parafoil phase of the V131R and V133 aerodynamic drop-test vehicles, and for the supporting tests using a parafoil microlight aircraft and large drop pallets flying the full parafoil. The X-38 family of prototypes is supporting a robust flight test programme, providing the flexibility to operate and evaluate multiple flights with parallel rapid turnaround of the test results. The X-38 is an innovative combination of a lifting body shape (first tested as the X-24 in the late 1960s and early 1970s) and today's latest aerospace technology, including CMC hot structures for control surfaces and nose TPS, the world's largest parafoil, GPS in combination with an inertial platform for primary navigation, and laser-initiated pyros for deploying parachute and parafoil, deploying the Landing Gear System and removing the inhibits for trunnion retraction. X-24 flight tests resolved technical issues critical to developing the Space Shuttle, the first reusable space transportation system. Today, the X-38 continues that tradition for the next manned spacecraft. The growing depth of X-38 design data combined with continued flight testing is leading to the desired level of crew safety and reliability for the final CRV design. In addition, zero-gravity tests using NASA's KC-135 aircraft are helping to define CRV operational capabilities and man-rating aspects, including crew ingress and egress, seat design and display techniques. In a rapid prototyping environment and using effective management and decision-making processes, ESA is developing X-38 subsystems at an unprecedented low cost. Flight-testing enabling technologies for man-rated, reusable reentry vehicles creates the base for European industry's significant role in CRV development. Most of ESA's subsystems have been delivered for system-level integration at JSC. Recent deliveries were the Pyrex sensor, the nose primary structure and the first batch of TPS blankets. The CMC leading edges and the fault-tolerant computers with adaptive reentry software will be accepted and shipped to JSC in the next few months. The Landing Gear System is ready for assembly once test fixtures are received from NASA. The V131R, the latest aerodynamic vehicle, refurbished to reflect CRV's shape, was successfully flight-tested for the first time in November 2000; five more V131R flights are scheduled, beginning in May. November's test scored a number of firsts: first flight of the real (ESA-designed) vehicle shape; first flight of the full parafoil; first flight controlled by ESA's GNC for the parafoil phase. The V201 spacecraft will be powered up in March at JSC, followed by the modal survey test in July and the acoustic test in September. Shipping to the Kennedy Space Center is scheduled for April 2002. While the X-38 has been designed to address the specific needs of the CRV programme, it is a flexible, robust and cost-effective testbed that will answer a wide range of key questions about technologies and operations of future reusable manned spacecraft. It helps researchers to probe the hypersonic transatmospheric flight regime, and it addresses questions fundamental to industry's future capability for developing operational fully or partially reusable spacecraft. There is a need to take a closer look at potential future developments beyond the CRV. A Crew Transfer Vehicle (CTV) may be the next logical step, eventually complementing the Space Shuttle. A potential evolutionary path from the X-38/CRV to a CTV could be an initially space-based, fully operational vehicle offering augmented on-orbit capabilities such as rendezvous and docking, as well as routine landing on runways. Evolutionary development from the CRV would be a cost-effective transition for ESA and European industry into the next generation of reusable manned spacecraft. A European CTV preparatory programme should be started in the near term to secure a key role for Europe in future human spaceflight and exploration.